Watermark 920 is available for on-site ceremonies. 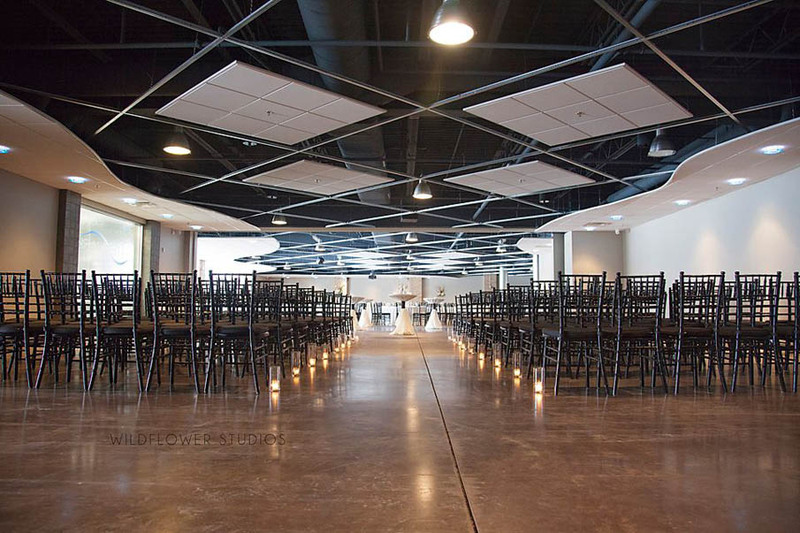 Our space is big enough that brides can have the ceremony and reception all in one place. Contact Laurel Sass at laurel@watermarkcenter.com or 231-578-0469 for details. Many brides are now saving their guests a car trip to a second venue. Onsite wedding ceremonies we have here at Watermark 920 are becoming more and more popular with couples. 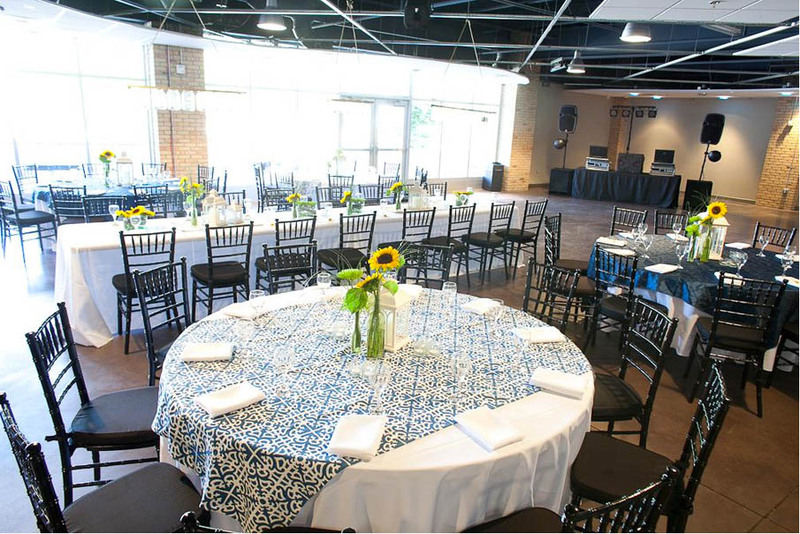 We've held great wedding receptions here at Watermark 920 since we first opened, but I've noticed a recent trend: couples want to have their wedding ceremony here, too. It is so convenient! Guests don't have to worry about finding their way from a church to a reception hall. This can be a real concern for relatives from out of town, unfamiliar with the Muskegon area. That dash from the church parking lot to hall is eliminated when the ceremony and reception are in the same place. Large get togethers are for mingling, catching up with people we haven't seen in a while, and meeting new members of the family. Precious time is wasted driving from one place to another. A lot of couples just want to get the party started! Starting their ceremony at 4:00 p.m. and rolling right into the reception allows for more socializing and dancing time with their guests. Because more couples are asking about it, we've developed a nicely priced package that includes ceremony-style set-up, a rehearsal the day before, day before set up, and use of our A/V system if the couple needs to play music or use a microphone. Make use of your venue's event coordinator to personalize the space. Above, shabby chic. Below, left and right, color used in interesting ways. Be sure to take full advantage of the venue's onsite event coordinator and all of the tips, advice and contacts they have to offer. This person typically works with dozens if not hundreds of groups every year and is a great source of knowledge for you. Watermark 920's own Paulina Lawton of Envision 360 Events can work with you to help conduct your ceremony, and the events that follow after. A bride needs only to add her personal touches to make the setting here unique. Because of our neutral palette, every color looks beautiful in our space. Our venue has an upscale look and is truly one of a kind. Here's how it works at the Watermark. Our space is big enough that brides can have the ceremony and reception all in one place. After a ceremony concludes, our staff helps to usher everyone out and into the reception room, where cocktail and appetizer hour begins. If room set up needs to occur after the ceremony, our staff works efficiently to make sure your room looks beautiful to start your party. Make sure your ceremony venue has plenty of room, like this setup at Watermark 920. The palette is neutral prior to the bride's personal touches. Photo by Wildflower Studios. We can help! At Watermark 920, our planning system with preferred caterers, photographers and designers, along with our on-site event coordinator, is designed to eliminate the pitfalls and accentuate the celebration. It's your day. You should be breathless because the day was so beautiful, not because the planning was so exhausting. Let's talk over the details! Call (231) 727-0805 x4201 or email me at laurel@watermarkcenter.com.